Today is the end of SP10. I can now, finally, share the links to the 70 knitters in Europe whom I've gotten to know a bit over the last eighteen weeks. I've spent Sunday mornings reading each of their blogs, seeing if they were keeping up with their weekly postings and if they'd received any goodies from their pals. One graduation, two weddings, three trips state-side to NYC, a couple of health scares, no new babies...it's been and interesting few months! Now, I too will join their ranks and clean my bathrooms! Sure, these are knitting blogs but, HEY! 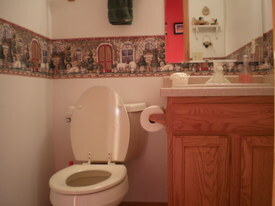 at least the photo here is the powder room with it's sheep wallpaper border and knick knacks (is that how it's spelled!?!) bric a brac. Knitters...changing the world...one bathroom at a time! After an excellent start to my current pair of socks, they were travel ready. We hit the road. As we approached our destination (and that point where the gusset increases needed to begin), I decided it was time for a photo shoot with Shaun. you got it: a trip to the frog pond! Then a trip to the bookshelf. Nancy Bush to the rescue! One pair of Bamboo Gentleman's socks coming right up. 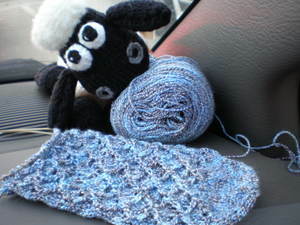 Now that the wool is happy, they seem to be flying off the needles. Yikes! The things we'll do to keep our wool happy!!! In addition, Wednesdays around here we have been busy checking out recipes. We invested in a "farm share" through Local Harvest. 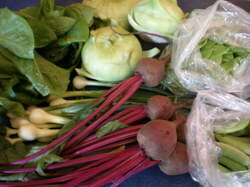 Each Wednesday we get our allotment for the week and we never know WHAT is going to be in it. Each week has a different assortment of items. The first week included the usual suspects plus farm fresh honey and strawberries. Last week's included a loaf of outstanding (!!!) whole wheat bread with flax and lots of (colon cleansing) types of seeds. An added benefit to receiving the farm share (besides supporting a local farmer and including more fruits & veggies in our diets) is that menus have gotten a great deal easier to come up with around here. It's easier to think about what to make for dinner when there is a bag full of pea pods in your fridge waiting to be used up because who knows what will be in next week's bag! So for the summer, "Web Wednesday" might be "Farm Share Wednesday". 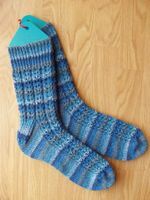 A new swap combines the goodness of Secret Pal with Sockapalooza---Sock It To Me Sock Swap---June 30th deadline. Do you have questions about socks? Casting on, Binding off, General construction, Grafting, Top Down, Toe Up, types of Heels, types of Toes, and more? 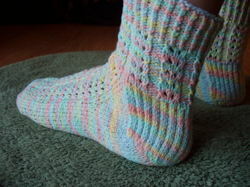 Lauri B's Toes & Heels has all kinds of links to sites where you can get your sock questions answered! Note: Saturday night I'll share the blog links to the 70 participants from my European SP10 group...just in case you are in need of a MAJOR web surfing experience! Soon, the Third Drawer will have a few new visitors. KnitPicks has done it again; this time introducing Risata. 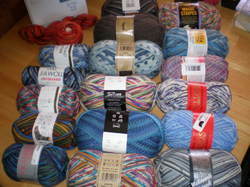 I have ordered yarn to attempt Cookie's German Stocking. Time to crank out a few socks. I'll need to check my "recipient list" to see who is in need of a new pair or two. In February these socks came to life when my Mom challenged me to come up with a new design as her "gift" to me: attempt to come up with a sock pattern with the ever stretchy Cascade Fixation. The pattern needed another needle check (I failed to write it down for pair number one) and my aunt was the happy recipient of Fixated Yet. Unfortunately, Karen's birthday was not enough incentive to get the pattern posted. 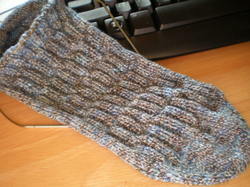 Though it was finished and tested ONE MORE TIME for Special K's special Healing Socks. So, at long last here is the promised pattern pdf (it's also in the sidebar). Coincidentally, the double-eyelet pattern now has also mesmerized the fabulous Wendy. Hers adds an additional knit stitch in the gap between eyelet sets. Knitting is so much like cooking, each cook adds their own "special spice" to a beloved "recipe"...and socks really do "feed" my soul! I have spent the weekend mostly away from the computer. Today we went to a strawberry festival where it was soon discovered that I'd committed a blogger's #1 "sin"...I'd forgotten the camera! So instead of showing you photos of the new sock, Coupling, with succulent strawberries...here is blue Regia Bamboo with Isabella. The back is finished. 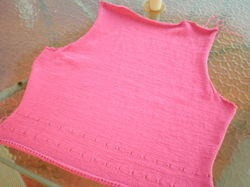 The colors are lovely and the Knit Picks Shine Sport is smooth and moves freely as I knit. Which will get more of my attention this week; sock or sweater? It's too soon to tell. THIS is how I started my day...Ravelry. 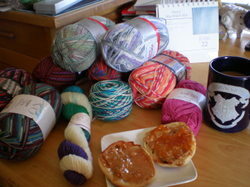 After successfully loading sixteen potantial pairs of socks to the photo album and my stash yesterday, I fooled myself into believing that I could do an hour's worth each morning...after my blog reading with coffee and breakfast. Then I came home from work. Then I thought "one more hour" and, in a flash, the Second Drawer of Sock Yarn spewed forth its contents. But look, they were such an orderly group. How could I resist!?! One by one they were photographed and categorized and loaded into the database; happy to "mingle" with siblings and friends. We are now up to Forty-Two potential pairs of socks!!! I don't know as if I appreciate knowing this particular fact! Thankfully, the Third Drawer of Sock Yarn left to be entered. This is the drawer of "solids". I'm sorry. They'll have to wait. 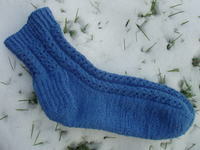 I need to knit...a pair of socks...I'll need needles...Ravelry has a needle inventory!?! People, we need an intervention! My invitation to Ravelry came and I've been a bit "overwhelmed" at the idea of entering everything. (Stash, needles, patterns, projects...) There are only so many hours in the day. But with the start of summer (of socks), it seems a good time to get started in small doses. 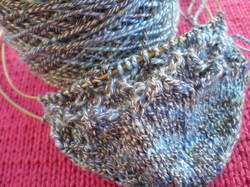 If I just start with entering sock yarn (in small doses), then I can stay ahead of the curve. First up: the photo shoot. 16 potential pairs of socks came out of their drawer. 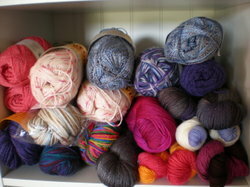 Some of my favorite yarns and the bamboo ones that will probably be knit up first for summer socks. They patiently waited their turn to be photographed in order to have their "head shots" loaded to Flickr. (Gosh, I hope that link works...still learning Flickr.) Next: load the photos into my Ravelry stash. I won't bore you with all of the details, but I managed to listen to an entire episode of the Lime & Violet (all 77 minutes of it) and Stitch Stud & His Bride (32 minutes) podcasts while loading photos!!! 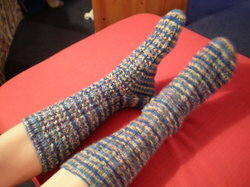 Now, ask me how much sock knitting was accomplished today...can you guess? It's been busy around here, so tonight is a bit "light" on links. And finally, someone has posted the Top 10 Geekiest Yarn Creations. I don't agree with all of their choices (As a regular Aija reader, the inclusion of BMP is just plain wrong! ), but some are truly odd.